No part of this content may be reproduced, stored in a retrieval system or transmitted in any form or by any means, electronic, mechanical, photocopying, recording, scanning or otherwise, except as permitted under Sections 107 or 108 of the 1976 United States Copyright Act, without the prior written permission of BRM Institute. 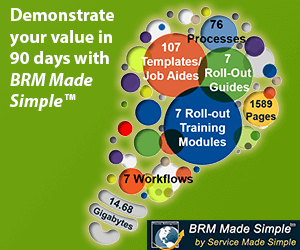 BRM Institute Business Relationship Management, BRM Institute Business Relationship Management logo, Business Relationship Management Interactive Book of Knowledge (BRMiBOK), BRM Institute, BRMP, CBRM, You maximize business value. We maximize your potential., Business Relationship Management DNA (BRM DNA), Certified Business Relationship Management Trainer (CBRMT), are trademarks or registered trademarks of Business Relationship Management Institute, Inc. and/or its affiliates in the United States and other countries, and may not be used without written permission. All other trademarks are the property of their respective owners. BRM Institute makes no representations or warranties with respect to the accuracy or completeness of the contents hereof and specifically disclaim all warranties, including without limitation warranties of fitness for a particular purpose. No warranty may be created or extended by sales or promotional materials. The advice and strategies contained herein may not be suitable for every situation. This content is provided with the understanding that BRM Institute is not engaged in rendering legal, accounting, or other professional services. If professional assistance is required, the services of a competent professional person should be sought. BRM Institute shall not be liable for damages arising herefrom including but not limited to personal injury, property or other damages of any nature whether special, indirect, consequential, or compensatory, directly or indirectly resulting from this content, use of application, or reliance on this content. The fact that an organization or website is referred to herein as a citation and/or a potential source of further information does not mean that BRM Institute endorses the information the organization or website may provide or recommendations it may make. Further, readers should be aware that Internet Websites listed herein may have changed or disappeared between when this content was written and when it is read.